Be sure to follow us on social media for content and discussions! When I went to try and settle my tax issues, the advice that I received was "Y'all need to have a baby or buy a house." At that point, I pulled up realtor.com and began trying to research the housing market. While it seems dramatic, it's not. 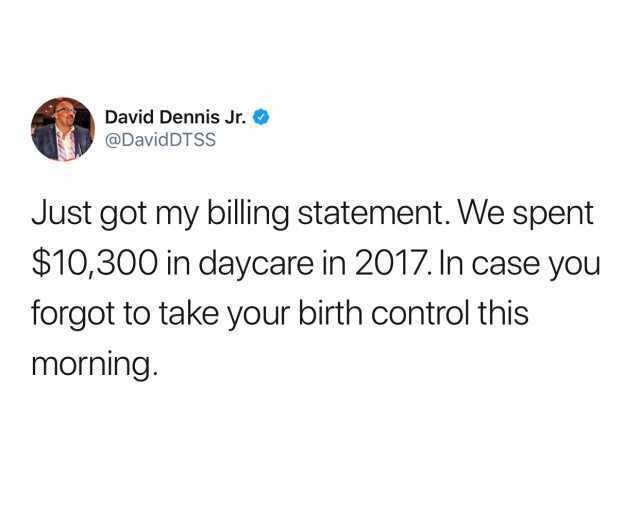 I say this because after my research, it would be cheaper for my husband and I to invest in a home rather than have a baby. I was scrolling around on social media when a stumbled upon the tweet displayed above. Now, I'm not sure what sort of child care this family has, but I know that $10,300 is a lot of money. Money that I don't have right now. My mother is in the childcare industry and she often reminds me that on average, parents pay about $350-500 a week for child care. This isn't including anything else that you'll need to purchase for the well-being and comfort of the child. So, saying that I'm a little stick shocked by the cost of raising a child is somewhat of an understatement. With that said, God bless all the parents out there.